The first image shown is entitled The Prodigal Son in the Tavern, aka, The Prodigal Son in a Brothel. 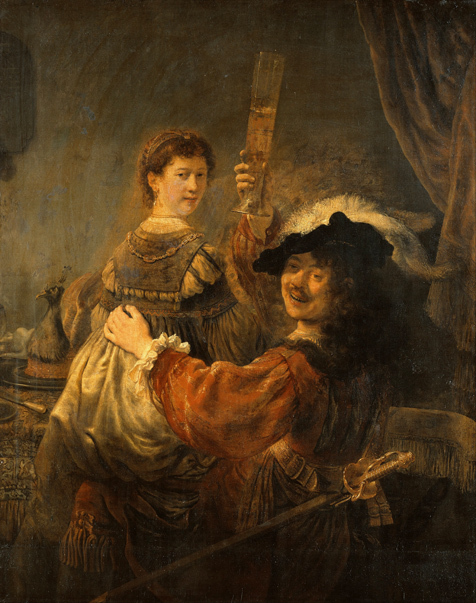 It is a depiction of the artist Rembrandt and his wife Saskia in the parable of the Prodigal Son. Yes, this is the same Rembrandt that painted The Return of the Prodigal Son. Rembrandt painted the first image not long after he married Saskia. In Rembrandt’s work, there is something special captured in the faces of his subjects. Facial expressions are captured, but there is more. The faces reveal much about the individual. They feel like a biography; something of a view into the subject’s very soul. Look at The Prodigal Son in the Tavern again. Circa 1635-1637. We see a young, wealthy man. He is dressed in expensive clothes, a beautiful hat, and he carries a sword. In one hand he holds a drink, in the other he holds a women. Look at his face. Mouth open, half drunk, and ready to explore everything the 17th century world can offer him. In 1636, Rembrandt was an artist on the rise. Six years later, Rembrandt would have buried his first three children, who died in infancy, as well as his wife. He is left alone with one son, Titus, who would also precede his father in death. By 1656, Rembrandt was in serious debt. He sold off many of his paintings, his antiques, and his house in order to avoid bankruptcy. A lot can happen in 20 years. Historical records on Rembrandt are paltry. However, two things stand out. First, Rembrandt read the Bible. He was recorded as owning two books at one point in his life, Josephus’s History of the Jews and a Bible. At the end of his life he had only one book, his Bible. 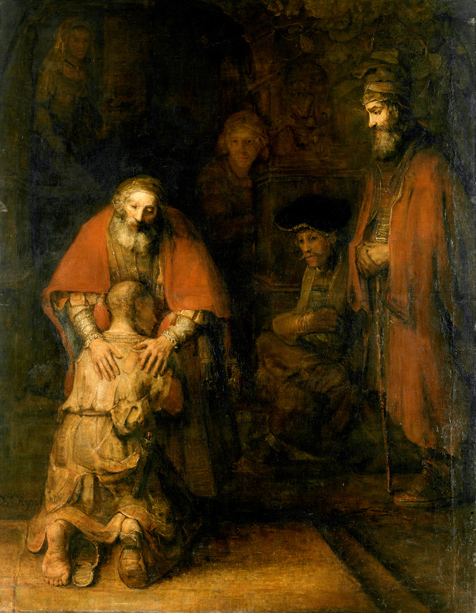 Second, Rembrandt reveals himself in his art as we saw in his work The Prodigal Son in the Tavern. We see him identifying himself as a sinner in The Raising of the Cross where he depicts himself helping to raise the cross on which Jesus is crucified. Rembrandt’s The Return of the Prodigal Son was completed near the end of his life. Considered to be one of his greatest works, Rembrandt sums up his life with this painting. He was a sinner, a believer, a Bible reader, an artist and a prodigal son. At the end of his life we find him in humble repentance returning to the Father.